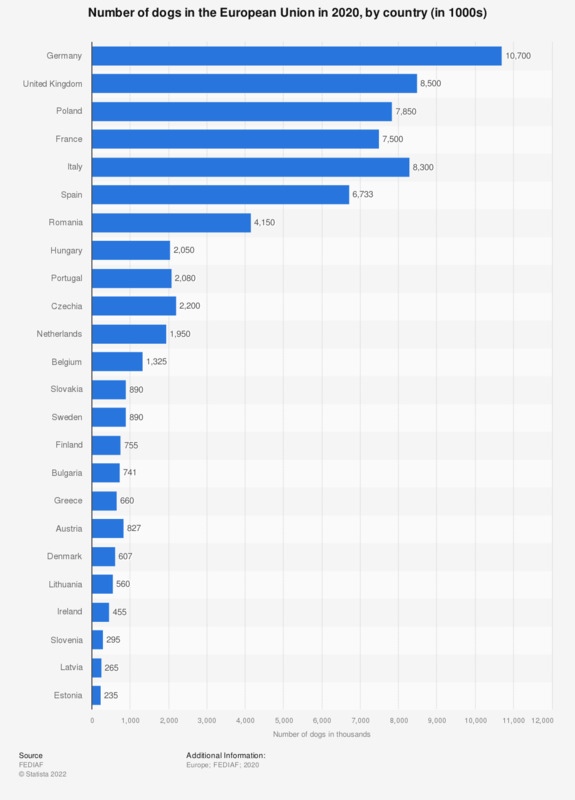 This statistic presents the number of pet dogs in the European Union by country, as of 2017. Germany ranked highest with a dog population of approximately 9.2 million in 2017, followed by the United Kingdom (UK) with 8.65 million. The number of dogs in Europe has seen a notable increase since 2010, with the number of dogs significantly increasing by more than eleven million from 2010 to 2017. The total amount of number dogs reported in 2017 was estimated at 85 million. As the statistic shows, the United Kingdom is the leading European country for dogs, with over half of dogs owners owning a pedigree dog. This term defines a dog that has a traceable ancestry and breeding line. This may be useful to pet owners when looking for an animal with good health conditioning, or if the owner is interested in a very specific look for the dog. Pedigree dogs are predominantly bread for purchase. In Romania, at least 46 percent of the population own one dog at home, this is nearly double that of the United Kingdom where 24 percent of the population own a dog. Everything On "Pet ownership and pet care market in Europe" in One Document: Edited and Divided into Handy Chapters. Including Detailed References. How much would you be willing to pay for a tracking device and software?